I dropped the bright white main sail, secured the halyard, tied six marine blue nylon ties around the sail’s bright white folds, and finally, stepped back into the cockpit. 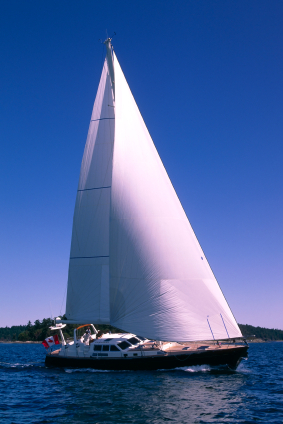 The sailboat purred as my children, their father, and I approached Oak Bay Marina under engine power. A bald eagle soared high above us, a curious raven cawed, flying above the mast, and a gull landed on the bow, checking us out. Standing in the cockpit of the Sagale on a sun-filled August afternoon, Mark and I prepared to dock near Victoria, British Columbia. In the main salon 14-year-old Anna read Little Women while eight-year-old Ben played with Legos on the cabin floor. Scanning the red numbers on the black box attached to the cockpit wall, I said, “Thirty feet.” We slowly moved toward the marina. “What does it say now?” Mark asked. “Not! It’s the distance from the water line to the bottom? We’re going to hit bottom! See for yourself,” I said. He is so wrong! This is so typical and here I am trapped on this boat with him. I estimated the distance from the waterline on the boat’s wide hull to the tip of its keel, guessing the keel alone must be at least six feet in length and the hull had to be another five or six or more feet. Easily twelve feet in all. The incoming tide would lift the boat, but running aground could have compromised the vessel’s integrity. The possibility loomed that the sailboat suffered damage that we could not see. Was the hull was cracked? On a calm, sunny day, in shallow water, we may have wrecked a ship that had been entrusted to our care. The Sagale, Grandpa Lewis’s sailboat, might take on water. Neither of us needed to say this out loud. What’s more, we knew better than to enter a port without checking the tide table. Mark said, “Call the marina and ask them what the tide is doing.” He was the captain of the vessel and I, the first mate, followed orders. “When all else fails,” I muttered as I picked up the marine radio mouthpiece. The call, an admission of not checking the tide table, would be heard by other boaters monitoring the same marine channel. Now that the boat was stuck, we had to know about the tide. “We have a reservation for two nights. What, exactly, is the tide doing?” I asked. “Flood tide,” came the two word response. Whew. The sea was at a still point; the tide had stopped going out and would soon begin its return. Our vessel listed toward the shore and creaked wearily. Stuck. What if water gushes through the cabin? Mark makes the decisions and I have to deal with the consequences. When we’re sailing, I face primal fears. Will we crash? Will we sink? Will we drown? “Let’s send Anna and Ben to shore in the dinghy. It’s so close,” I said. “In case of what?” I asked. “Just do it,” Mark ordered. I scampered down the worn wooden steps to into the cabin. Pushing clothing into duffel bags I had an image of the boat going under. One by one I heaved four duffle bags into the cockpit. By this time, Anna and Ben had rowed the 100 feet to the rocky shore. Looking across the water, I saw Anna, pointing, giving her brother directions. Ben jumped out of the dinghy, waded through the shallow water, grabbed the line, and pulled the boat up on the sand. The children climbed on a large rock, sat down, and watched us. The two waved across the water while Mark and I waved back. When the tide returned, the boat lifted, and Mark guided us to our assigned space. Holding a line, I jumped off the boat and tied the bowline to a heavy metal cleat on the dock. Mark stepped off and tied the stern line to the cleat at the other end of the boat. Hearing the tap, tap, tap, of feet, pounding the dock, I looked up to see the children running toward us. Anna and Ben called, “Mommy! Daddy!” They pressed themselves against our waiting arms. Laughing and nearly crying, I said, "Anna! Ben! I love you so much. You did so well." Mark said, "I couldn't ask for a better crew." "Anna bossed me around," said Ben. "He did everything I asked," said Anna. Kristine Mietzner teaches memoir writing in the San Francisco Bay area. She lives with her golden retriever Max in Benicia, California.